The following steps can be used to add real-time read and write data functions to a C#, C++, or Visual Basic.NET WinForm or Windows Service application. 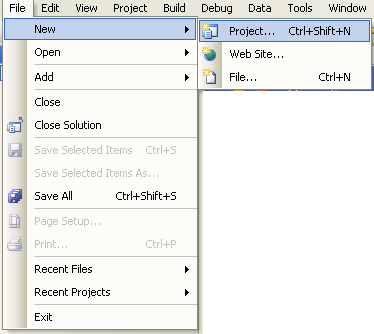 The .NET Data Connector data component can also be used in ASP.NET Web applications. Refer to the Read Values and Write Values Forms in the VB.NET example for programmatic interface of using the OPC Controls Data component. All properties are programmatically accessible. 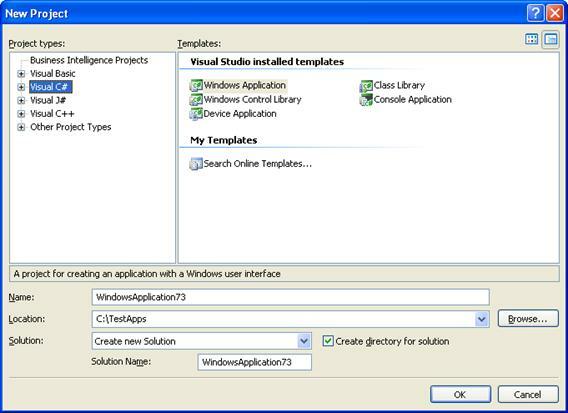 The component can also be used with Visual Studio 2003 with the older 1.1 Framework version of Open Automation Software. From the Toolbox if OPCSystemsData component is not available right click in the Toolbox and select Choose Items. If it is available to Step 4. 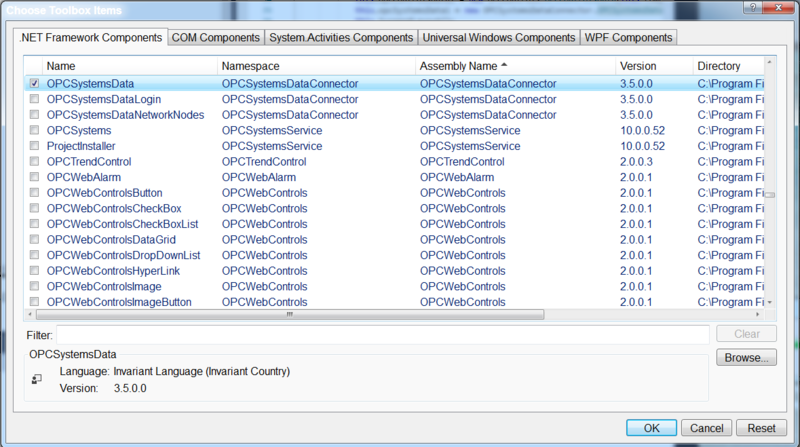 From the .NET Framework Components select the OPCSystemsData component from the OPCSystemsDataConnector assembly and then select OK.
Add an OPCSystemsData component to the Form. Change the Name of the button to buttonAddTags. Note: If you wish to run this application on remote PCs make sure to include the Network Node or IP Address of the OAS Service source. To connect to remote tags simply include a network node name or IP address as follows. Note: You can additionally use DirectOPC items with the OPC Controls Data component to connect directly to OPC Server Items without having to create Open Automation Software Tags. 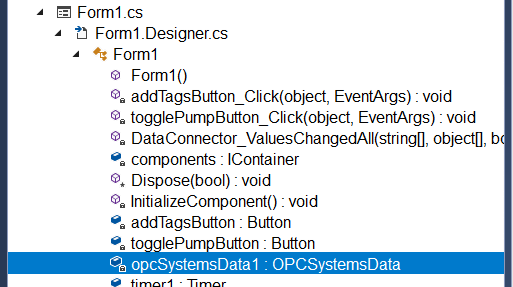 To see the full syntax of a DirectOPC Item use an OPC Control Label and browse an Open Automation Software Tag for the Text_OPCSystems_Tag property and select DirectOPC. View the code of Form1. 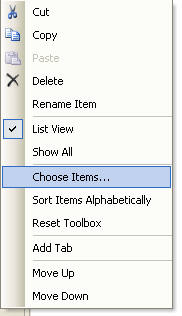 Select OpcSystemsData1 from the object list. Then simply copy the files in the binRelease directory to the target systems or follow the Smart Client deployment section in this help file to deploy your application using Click Once Deployment.